What’s up with spiralizing vegetables, and is this a trend worth looking into? In our opinion, it’s a delicious way to serve vegetables and will only gain popularity as word spreads and people try it. And it’s a fantastic way to add more vegetables into your family’s diet in a less obvious way. Basically, you use a raw vegetable, such as zucchini, squash, sweet potato, or beet, and turn it into a pasta-like strand that you can use in place of traditional pasta. To do this, you can use a nifty kitchen gadget called a spiralizer. However, if you don’t have a spiralizer, you can still try out veggie noodles using common kitchen tools, such as a vegetable peeler, a julienne peeler, or a knife. These “noodles” are gluten-free and add beautiful colors to your plate. They also deliver all of the health benefits of added veggies, such as vitamins, minerals, fiber, antioxidants, phytochemicals, and more. With kids, frequent exposure to foods is a key way to get them to enjoy and eat those foods. So this is yet another way to expose kids to vegetables in a fun new way. When spiralizing vegetables, clean the vegetable as you normally would before preparing. For zucchini and squash, you can leave the peeling on. For beets, you would peel first before spiralizing, and for potatoes and sweet potatoes, peeling is optional. This “What can I spiralize?” resource has a list of vegetables and fruit that you can spiralize, whether you should peel it or not, and suggested simple preparations (raw, baked, sautéed, roasted and more). Vegetable Peeler: Use your vegetable peeler to peel long noodle-like strands from your vegetable. Julienne Peeler: Again, use your julienne peeler to peel long noodle-like strands from your vegetable. Knife: Use a knife to slice long strips of the vegetable and keep slicing until you reach the desired size. 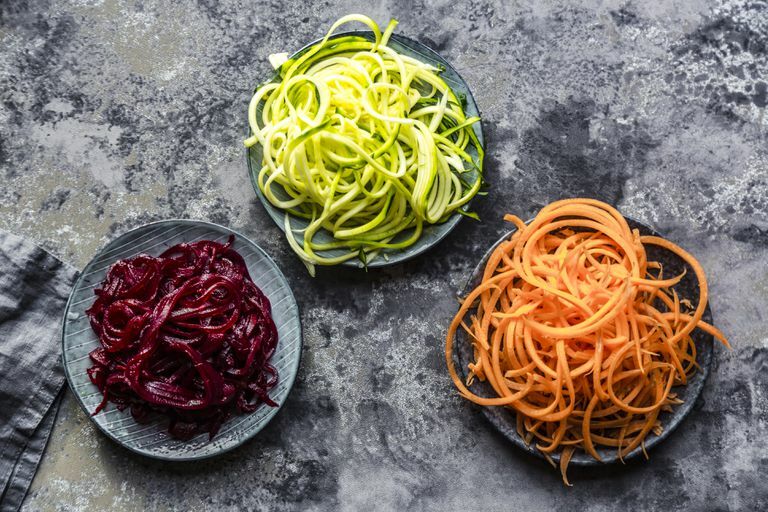 As you begin your spiralizing adventure, you may be wondering how you’ll get your kids to eat these lovely spiralized vegetables. Here are a few tips for getting started. Start with mild tasting vegetables: Vegetables such as zucchini, broccoli stems, cucumber, potato, sweet potato, and carrots would be good vegetables to start with. Peel if you need to for appearance: If your child naturally resists green foods (or pasta with green strands), peel your zucchini first. The flesh of the zucchini looks noodle colored and could be mistaken for noodles if you are going for a sneakier approach to serving. Cut it: If you are using a spiralizer, you could have some very long noodles. You may want to cut your noodles into more manageable, bite-sized pieces for your child. Add it: What can you add small bits of spiralized vegetables to? Maybe add some to pasta salad, green salad, or sauces. We’ve even added spiralized carrots to a sandwich. Get kids in the kitchen: If you aren’t trying to sneak the spiralized vegetables into your meal, get the kids into the kitchen to help. They’ll be learning about healthy meals alongside you, giving you together time as well as giving your child the important job of helping to feed the family. Depending on age, even if your child can’t actually spiralize the vegetable, he/she can wash the vegetable, possibly peel it, maybe cut the noodles into smaller pieces, and/or plate it. Spiralizing vegetables is another tool for your treasure trove of ways to get vegetables onto the table and into the mouths of your children. Whether your children freely eat vegetables or resist them at every meal, this is a way to present them in a different texture and style that may help you gain a vegetable victory. What Are Microgreens and Are They Healthy?